I know it can be hard to resist the longing stare of a dog begging for human food. Sometimes it can even feel like you are neglecting your pooch by not giving in, but it’s important to remember that most of the food we eat is not necessarily good for your dog. If you own a pooch, it is vital that you are aware of the poisonous foods for dogs. Here we have compiled an alphabetical list of all of the foods that are toxic to dogs. Alcohol – We all know the adverse effects alcohol has on humans. Well, alcohol has similar effects on dogs, but much quicker and easier. The worst symptoms include difficulty breathing, coma, and death. Avocado – Avocados contain persin, which is harmless to humans, but can be fatal to dogs. Even the plants are known to be toxic to canines. Bread Dough – When ingested by a dog, the yeast will expand and cause abdominal pain. Also, as we all know, when yeast ferments the dough, it produces alcohol, which is poisonous to your pooch. Caffeine – Including coffee, soda, energy drinks, diet pills, etc. Caffeine can cause hyperactivity, vomiting, elevated heart rate, hypertension, abnormal heart beat, tremors, hypothermia, seizures, and even death. Candy/Gum – Xylitol is a natural, sugar-free sweetener present in many gums, mints, foods, and toothpaste. It can increase the insulin circulating through your dog’s body, causing a drop in blood sugar and can lead to liver failure. Chocolate – Theobromine is the culprit here. It is present in all types of chocolate, but dark chocolate is known to be the worst. Ingesting even small amounts of chocolate can cause vomiting, diarrhea, abnormal heart beat, seizures, tremors and death. Fat Trimmings/Bones – Fat trimmings are known to cause pancreatitis in dogs, and bones are often associated with lacerations in your dog’s digestive system. Grapes/Raisins – There is no clear evidence to why grapes and raisins harm your dog, but they can cause vomiting, depression, and kidney failure. Human Medicine/Vitamins – Some will not harm your dog, just make sure there is no iron in them. 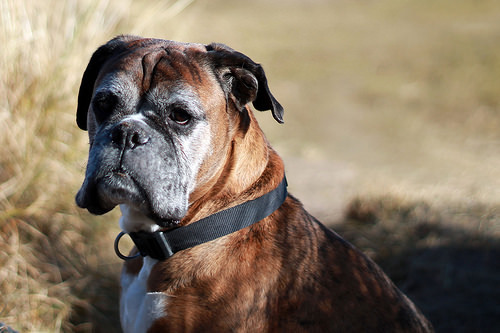 Iron can damage your dog’s liver and kidneys. Macadamia Nuts – These are known to be potentially fatal in dogs. Even just a few of these can cause severe problems. Symptoms include tremors, weakness, vomiting, rise in body temperature, and rapid heart rate. Milk – Milk, as well as most other dairy products (even ice cream) can cause diarrhea and other digestive issues. Moldy Food – Moldy bread, pasta, nuts, cheese, etc. all contain tremorgenic mycotoxins, which won’t necessarily prove fatal for your dog, but can cause vomiting, tremors, seizures, and hypothermia. Mushrooms – Just as some mushrooms are poisonous to humans, some mushrooms can be classified as poisonous foods for dogs. It’s probably best not to risk it. Onions/Garlic – All members of the allium family include onions, garlic, chives, and leeks. These can destroy your dog’s red blood cells, leading to anemia. Pitted Fruits – The seeds or pits of fruits can cause intestinal problems in dogs. Apple seeds, apricots, as well as peach and plum pits also contain cyanide, which is poisonous to humans and dogs alike. Raw Meat/Fish/Eggs – Raw meat and eggs can contain bacteria that lead to food poisoning. Also, certain kinds of raw fish (salmon, trout, shad, sturgeon) can contain parasites that can cause to be fatal. Make sure to cook these well. Salt – Excessive amounts of salt can have the same effect that it has on humans. It can lead to dehydration, diarrhea, and sodium ion poisoning. Star Fruit/Rhubarb/Tomato Leaves – These all contain oxalates, which can damage the digestive, urinary, and nervous systems. Sugar – Too much sugar in a dog’s diet can have a similar effect as it does with humans – obesity, tooth decay, and onset diabetes. When it comes to feeding human food to your dog, sometimes it’s best not to risk it. While some human foods may actually be good for your dog, many others can be classified as poisonous foods for dogs. For a list of human foods that are OK to give your dog, check out this post. Previous story Human Food for Dogs: Which ones are good for my dog?